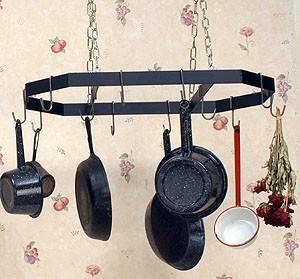 This simple black wrought iron hanging pot rack allows you to keep your kitchenware close at hand without cluttering your kitchen. 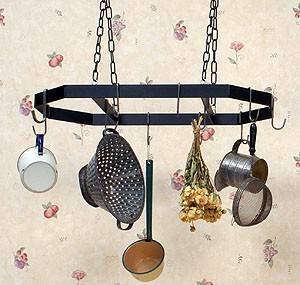 Measuring 27" long and including 12 hooks, you'll be able to hang your most needed pots, pans and other tools up and out of the way. Plus, you'll be able to enjoy the look of your tools even when you're not cooking! A great price point for a quality wrought iron piece made in the US heartland!